We have been looking up to Megan Griffiths aka @megs_braap for a few years now. Watching her ripping through the woods in BC, practicing braaaping over logs, or training with as much strength and determination as on can muster is truly inspiring. Megan applies herself to riding with all she’s got and drives the rest of us to push ourselves a bit harder. We cannot wait to meet her at Babes in the Dirt 4 this year! Read on to get to know a little more about her. I am from Kelowna, BC. I am 27 years old. I am an electrician but I have been working towards making a career in the motorcycle industry. I am working towards putting on riding clinics and group rides soon! I also love filming, editing, and creating content for my YouTube channel. I love spreading the love for the sport. Outside of riding, I'm a pretty adventurous person. I love snowboarding, camping, hiking, trail building, and basically anything outdoors. I am also a crazy dog lady haha. My dog and I go everywhere together, he's my partner in crime. How did you get in to riding dirt bikes? How I got into riding is pretty random. I had always wanted something with a motor ever since I was a young child. I loved adventure and I loved the thought of ripping around in the woods and exploring. I wasn't sure whether I wanted a quad or a bike but I eventually made the decision to get a bike at random and I'm really glad I made that choice! I didn't really have anyone to teach me so I basically just motored around on forest service roads for a couple of years until I met Hippy (just picture a long haired man wearing a hoody and pyjama pants in the dead of summer). He was working at our local riding area as the "camp host". He was the first person to really influence me with my riding. He basically showed me what woods riding is all about and helped mould me into the rider I am today. I have been riding for ten years now. What is it about riding that you love so much? There are a couple of things that I absolutely love about riding dirt bikes. The first thing is the adventure of it. I can't get enough of exploring new places and finding new terrain. I always need to see what's around the next corner or over the next hill! Being out in the woods is the best place for me. Another reason I love it so much is for the feeling you get when you start improving your skills and becoming a better rider. There is no better feeling than when you leave your comfort zone and succeed at something you couldn't do before. There is no limit to what you can do on a bike, the bar just gets higher and higher as you get better. There is no end to the challenge! My favourite place to ride would have to be here in Kelowna. My riding area is called Bear Creek. We have hundreds of kilometres of single track trails through the mountains. We have such a variety of terrain type as well as trail difficulty. It's a really great place for me to train and have a whole lot of fun. Is there somewhere in the world that is on your riding bucket list that you have not been to yet? Where? I've always wanted to ride Moab in Utah. I've seen so many pictures and videos of all these amazing rock features and I've just been dying to check it out for a long time now. What type of riding do you love most? Track, trails, single track, sand, enduro cross? Aah that's a tough one for me because I really enjoy almost all types of off road riding. I love riding the track because it's fun to go really fast, rail berms, and fly through the air, I love riding trails because of the adventure and the challenge of new or challenging terrain, and I love riding sand because it's super tough and is really great cross training for woods and track. If I had to choose an all time favourite though.... I would have to say trails. Share one of your most challenging riding experiences. One of my most challenging riding experiences outside of the ISDE in Spain would have to be my first time riding and area we have here in BC called McNutt. This place is known for it's tough terrain. It pours rain almost every day and the trails are all made up of boulders, roots, more boulders, and even more roots. Honestly, I remember looking at the trails and just assuming that it wasn't even physically possible to ride up. Clutch control, balance, and proper body positioning and weighting is hugely important there. Riding this stuff after riding the fast, flowy terrain back home for so long was definitely a wake up call. I may have had a "McNutt meltdown".... or two while I was there hahah. This place opened my eyes once more to what is possible to do on a bike though. It just made me want to try harder, learn more, and get better. Tell us what it was like to race the ISDE? Racing the ISDE was definitely the craziest thing I've ever done. I was so nervous going into it and had no idea what to expect. It was really really tough, physically and mentally. The days were long, and I had injured myself pretty badly on the first day. Finishing this 6 day race was probably the hardest thing I've ever done. I have many bad memories in the very back of my mind of the pain and the struggles with my separated shoulder and my concussion. The cool thing is though, that I actually have a lot of good memories as well. My mind was blown when I experienced the camaraderie even between teams from different countries. We had some really nasty conditions after some heavy rain and there were times out there when we'd work together to make it through. I specifically remember riding with one of the girls from Slovakia. We were similar in speed and we basically stuck together and got through. If I could use one word to describe my experience at this event, I'd say it was EPIC. What bike do you ride currently and why do you love it? I currently ride a 2017 Husqvarna TX 300 and a 2018 Husqvarna FX 350. I love my 2 stroke (the TX 300) in the technical terrain because it's light, nimble, and a total tractor. That bike is nearly impossible to stall. I love my 4 stroke (FX 350) in the more open terrain because it's smooth, planted, extremely fast, and is SO MUCH fun to ride in the fast, flowy trails. What are your goals as a rider? Who do you look up to in the moto world? My goals as a rider are to continue to improve on my skills and broaden my skill set. By that I mean that I want to become a more well rounded rider. Motocross, enduro cross, cross country, you name it! I love it all and I want to work on my skills in all these categories :). I look up to riders like Chris Birch and Graham Jarvis for their incredible skills, and I look up to riders like Victoria Hubacek and Malcolm Hett for their skills on the bikes but also for their passion and love for the sport. I watched both of them racing when I first started and they were a really positive influence on me. Have you ever heard of Babes in the Dirt? I heard about Babes in the Dirt last year on Instagram but was unable to come down and check in out. Are you looking forward to Babes in the Dirt 4? I am really looking forward to attending this event! I can't wait to meet a bunch of like minded women who ride motorcycles! What could be better right?! What advice do you have for someone who is interested in riding? My advice to someone who wants to get into riding is to never sell yourself short. It may seem tough or overwhelming when you first start but the possibilities are endless! I truly believe that anyone can achieve any level of greatness at whatever they are doing. It all depends on how badly they want it :). Over the years the crew at Husqvarna Motorcycles have become like family to us. Each year they come out and work their asses off to make sure that everyone has a good time. Get to know the amazing people behind the bikes we love! Hi Babes! I am Taylor, Marketing Specialist at Husqvarna Motorcycles. I have been with the company for almost three years and this is my third Babes In The Dirt! At Husqvarna, my day to day consists of a wide variety of things including advertising, communication materials, press releases, and race team marketing. It is an exciting job that keeps me on my toes. I started riding when I was a kid with my entire family. From there, I moved to racing truck and buggies. My passion for off-road and action sports runs deep and I am lucky to work in an industry that I love. Outside of work and racing, I enjoy spending a lot of time with my family, kitties and boyfriend, shooting guns, and working on my house. I look forward to seeing and meeting more ladies who want to ride dirt! I have been with Husqvarna Motorcycles since shortly after the acquisition by KTM. Hoping for a foot in the door to opportunities for growth within the company, I was hired as the administrative assistant. My two wheel background began in the mountain bike industry in the early 2000’s with Intense Cycles and I have been with Husqvarna Motorcycles for 4 years now. My current role is the Marketing Specialist for Street and Lifestyle for the brand. 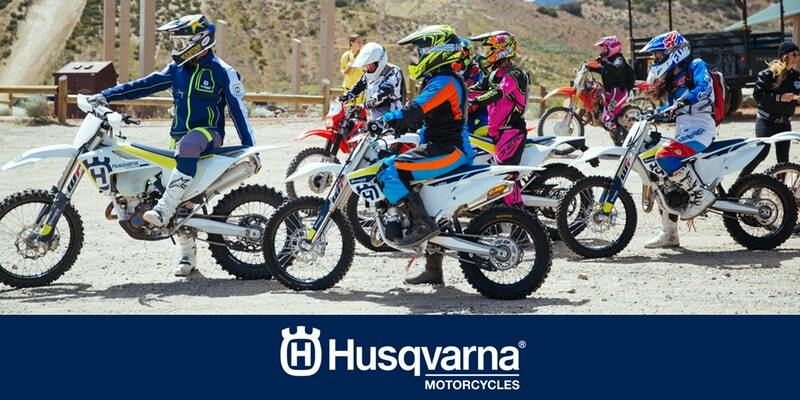 Aside from my daily duties of tracking and recording print and digital press, creating press releases, and coordinating efforts for demo events such as Babes In The Dirt, I work closely with the events team to create events and translate the marketing message for Husqvarna Motorcycles. Most recently I was able to go to New York to assist in introducing our VITPILEN and SVARTPILEN model range to the press announcing Husqvarna’s exciting return to street motorcycling. I have been riding motorcycles for a little over five years and while I have had my M1 endorsement for that entire time, I have only really been riding on the street for about the last year and half. Before feeling confident enough to get on the road I took my time learning to ride; becoming a better rider through MX and road track days, off-road group rides and desert trips. Outside of my office hours I spend time with my 14 year old son, Ethan, riding motorcycles, traveling, catching shows, strengthening my friendships and contributing to Two Wheels And A Purpose, a business podcast hosted by Jon-Erik Burleson and myself. Thanks for having us again this year, our entire team loves seeing the happiness that comes with the love of motorcycling brought to new women through this event! My name is Anthony da Graca AKA “Meatball” I’m the Media Relations Specialist at Husqvarna Motorcycles. I’ve been in this position for a little over 2 years now. My role in the company is to build and prep our dirt bikes and street bikes for magazine testing and articles, I attend media motorcycle shootouts, to ensure that the motorcycles are set up for each test rider in order to provide the best feedback possible. This will be my 3rd babes in the dirt and I’m really looking forward to be involved in another one. I started racing dirt bikes when I was 16 all just for fun. On my free time I enjoy going riding on the weekends and relaxing at home to mentally prepare myself for every Monday. Hello, my name is Scott Burtness, I am the Event Specialist here at Husqvarna Motorcycles. My role here consists of scheduling events to doing any mechanical work to the bikes when needed! I have been working in the industry for 10 years and here at Husqvarna for a year and a half and in that time I have been apart a lot of special things, from working with past champions and on their bikes to someone riding a motorcycle for the very first time to someone who has been around motorcycles their whole life and still has the same love for motorcycles they had when they first started riding! I got my first dirt bike when I was 10 years old, but my love for motorcycles started around the age of 6 years old, that is when I watched my first Supercross race, from then on I was hooked! The motorcycles community is very special and I am very thankful to be part of it and the Husqvarna family. Company: Husqvarna Motorcycles North America, Inc.
wash but wasn’t too fond if taking it off jumps yet. We enjoyed growing up with enough space to have an off-road loop and our own mini moto track which was built by an industry track building professional. We also enjoyed trips to the desert and local moto tracks. I, however, feel my skill level on a bike is still somewhere between where I was at during my time on the PW80 and the TTR125. Now the marketing manager for North America, I have a small but solid team that absolutely lives and breathes all things Husqvarna and together we look after all aspects of marketing including PR, advertising, social media, motorsports, events and other marketing communications activities. We cover all segments of the brand from off-road to street, racing to lifestyle. I also serve on the executive board of a not-for-profit corporation known as the U.S. Motorcycle Coaching Association aimed at growing the sport of motorcycling. This is our fourth year being a part of Babes in the Dirt, and my third year attending. It is our favorite event of the year because the people are rad and the experience is priceless. Whether you have been riding off-road all of your life or never before, you can rest assure that riding a brand new Husqvarna Motorcycle will be a highlight of your moto-loving life and help to take your riding to the next level. Top of the line suspension and having all the power you need makes for a fun day in the dirt. Trust us! Meet the fleet of Husqvarna Motorcycles that will be available to demo at Babes in the Dirt 4. Stay tuned for sign-ups and info. This year at Babes in the Dirt 4, Husqvarna Motorcycles will be bringing 20 demo motorcycles for beginner, new, and experienced riders. Beginning with the small displacement bikes, best for those “new-to-moto”, we have two, 2018 TC85’s. From there the bikes go up in engine size and seat height. The majority of the fleet will consist of 2018 FE250’s and a selection of other off-road and motocross models. Read on for a brief overview bikes that will be available at this event and visit www.husqvarna-motorcycles.com for full model range and technical specifications. The 2018 FE 250 will comprise the majority of the demo fleet at Babes In The Dirt. FE models are dual-sport motorcycles, dual-sports are capable off-road bikes that are plated and ready for the road. The engines are second to none in terms of overall performance and versatility making the bike accessible to both novice and experienced riders. These models will be lowered by shortening the Rear Shock 12mm, which lowers the seat height from 38.19'' to roughly 36''. The forks are then raised in the triple clamps balancing out the front and rear of the bike. Featuring seven updated models and an all-new TC 85, Husqvarna Motorcycles 2018 motocross range combines cutting-edge technology with high-end componts to offer riders of all ages and riding levels one of the most efficient and sophisticated motocross line ups on the market. The 2018 TC 85 17/14 is our standard size 85cc, meaning the wheel size is standard with a 17’’ front wheel and 14’’ rear wheel. This is a great beginner motocross bike with a low seat height of 33.46’’. A lower seat height gives a new rider the necessary confidence to feel comfortable while riding and stopping. 2018 TC 85 19/16 this is our big wheel 85cc, this bike has the same engine as our standard size 85cc but with larger wheels, a 19’’ front wheel and a 16’’ rear wheel offers a slightly taller seat height of 34.45’’. 2018 TC 125, is our standard size Motocross bike with a 21'' front wheel and a 19'' rear wheel. This bike is the natural progression for a rider who is out growing their 85cc and wants something bigger but with a minimal jump in power; perfect for those who are still gaining confidence in the dirt. 2018 FC 250, is a standard size Motocross bike and raced by the Rockstar Energy Husqvarna Factory Racing’s Zach Osborne in the 250 class. It features a 21'' front wheel and a 19'' rear wheel. These models will be lowered by shortening the Rear Shock 12mm, which lowers the seat height from 38.19'' to roughly 36''.The forks are then raised in the triple clamps balancing out the front and rear of the bike. 2018 FC 350, is our standard size Motocross race bike with a 21'' front wheel and a 19'' rear wheel. These bikes will be available for demo at the stock seat height of 37.8''. 2018 FC 450, this our standard size Motocross bike, the same bike Husqvarna Rockstar Energy Husqvarna Factory Race Team riders Jason Anderson and Dean Wilson ride in the 450 class for Motocross and Supercross.. The FC 450 features a 21'' front wheel and a 19'' rear wheel, this bike will be available for demo at the stock height with a seat height of 37.8 and should only be ridden by the most experienced riders. Stay tuned for sign-ups and info.